Get instant 1:1 help from expert developers. Build projects faster with on-demand live help from book authors, top Stackoverflow answerers, and A+ developers. #1: Sunday Morning Breakfast: Ever since I was very little, Sunday mornings have been reserved for doing something very special for breakfast. All week long we eat cereal, English muffins, Greek yogurt and the occasional egg. 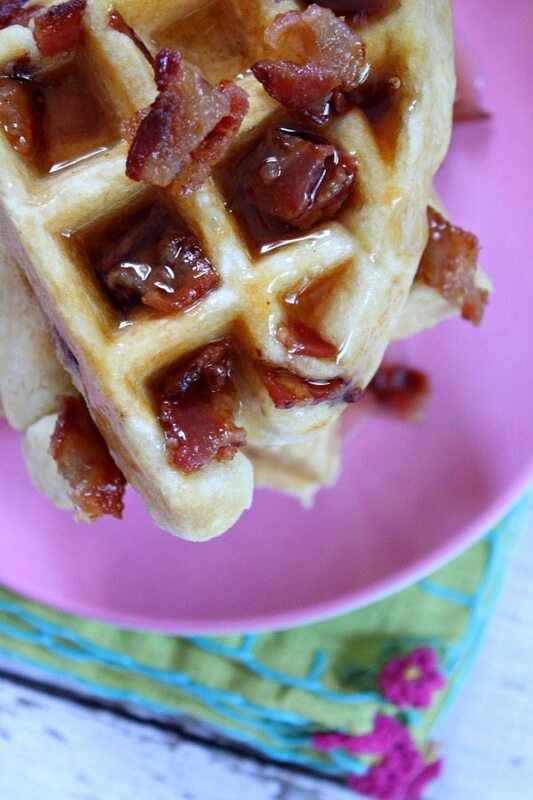 So by the time Sunday rolls around, it’s time for something that feels extravagant, like waffles! #2: BACON: Yes, it’s true… my family loves their bacon. My favorite way to cook it is in the oven (400 degrees, lie bacon on a foil-lined pan, 20 minutes or so). It’s no-fuss, totally simple to do, and so much easier to clean up than a frying pan full of grease. 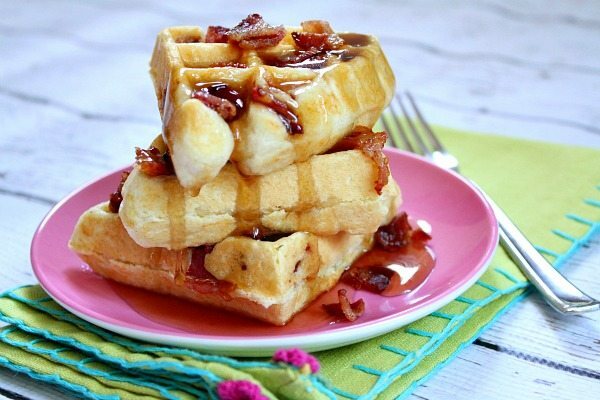 Bacon added to waffles is a delicious idea… mostly because when it’s combined with maple syrup, it’s even more amazing. You may be asking yourself, “What’s going on here? RecipeGirl is going cake-crazy!” Yes, indeed I’ve been going cake crazy. And I may just continue to do so! 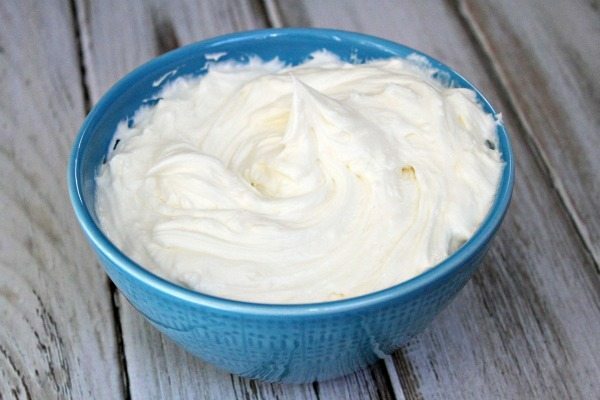 I’ve realized that RecipeGirl.com needs a greater stash of cake and frosting recipes, and I’m on a mission to give them to you! 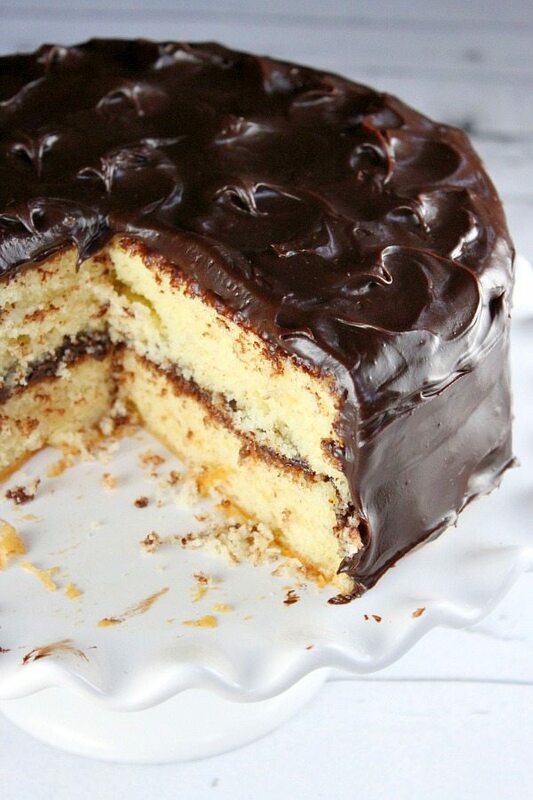 Everyone needs a good yellow cake recipe (you got that last week). 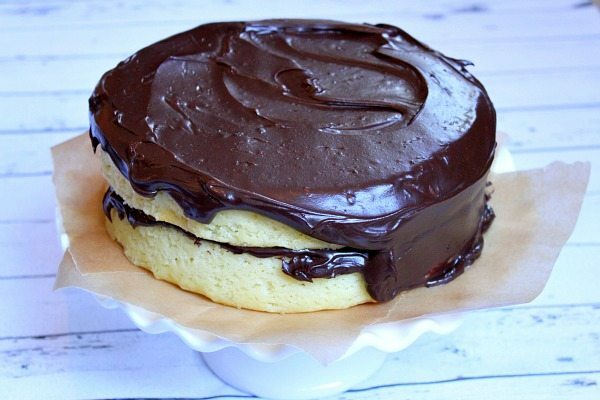 Everyone needs a most-excellent chocolate frosting recipe (last week as well). 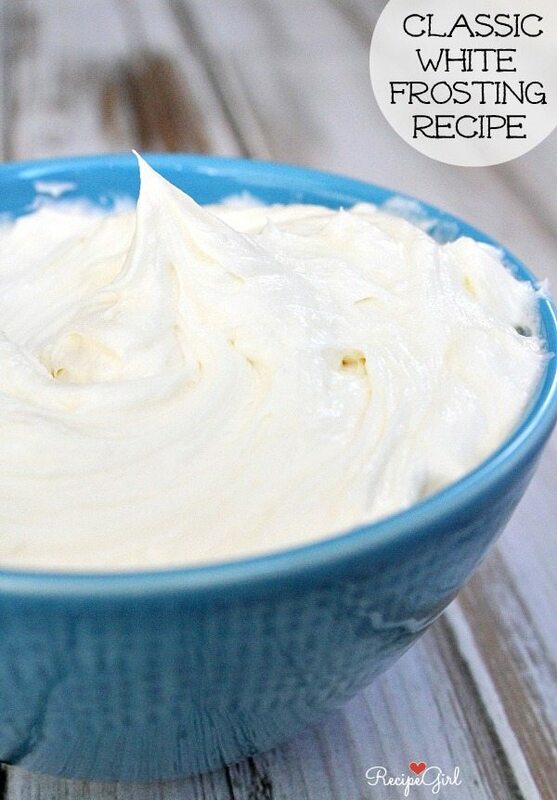 And now you’re getting a fabulous white frosting recipe. So you can probably guess what might be coming tomorrow, right? It was pretty tough to avoid grabbing a spoon and just going to town on eating this bowl of frosting. It’s pretty delicious! To achieve a nice white coloring, I used a brand of butter that was not terribly yellow (my store brand was perfect for that), and I happened to have some clear vanilla extract on hand too. You can locate that in the baking aisle of craft stores (or on Amazon- Wilton makes a version of it), and if you have a good baking supply store in town, they would most likely carry it too. 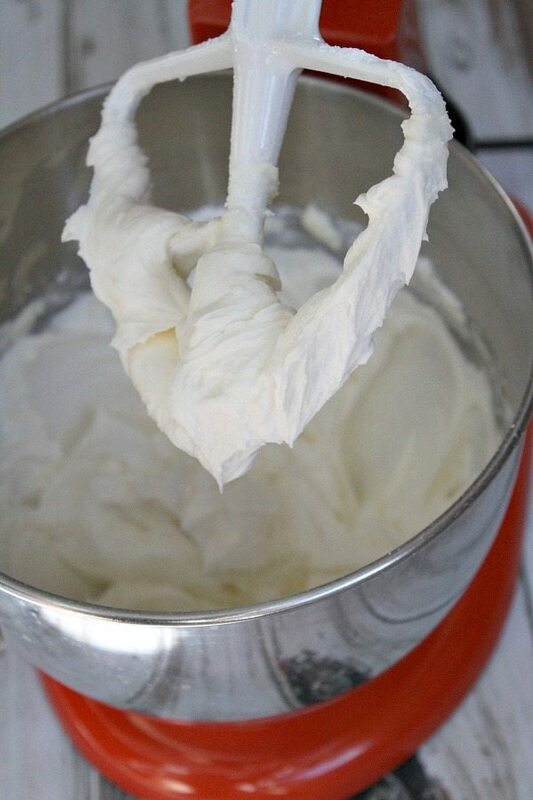 Be sure to check out tomorrow’s recipe to see where this frosting ended up! It’s really not that big of a deal, but it’s totally good and the family enjoys it. Frozen corn (fresh, if you’ve got it! 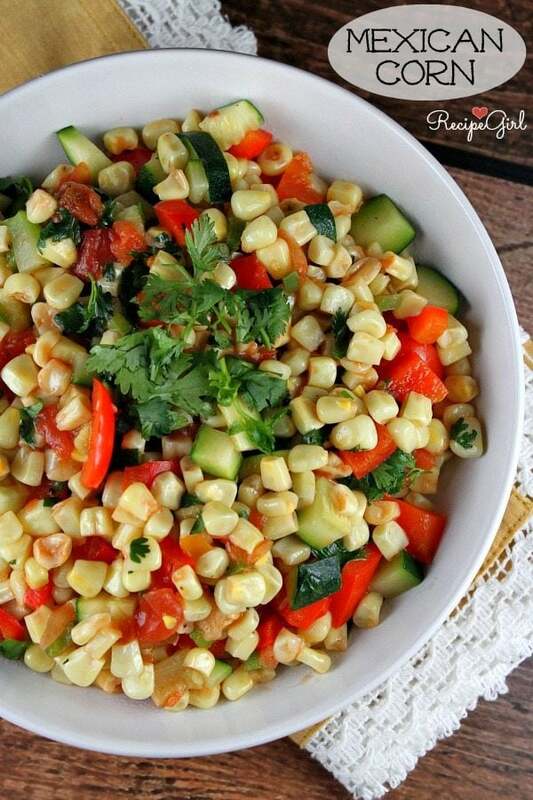 ), zucchini, bell pepper, green onion, jalapeno and cilantro. There’s some jarred salsa mixed in there too. Hints of Mexican-style flavors in there, as you can see. If you’re like me, you’re always wondering what might be good to serve with tacos, enchiladas or that Santa Fe Chicken recipe I shared yesterday. This is it. 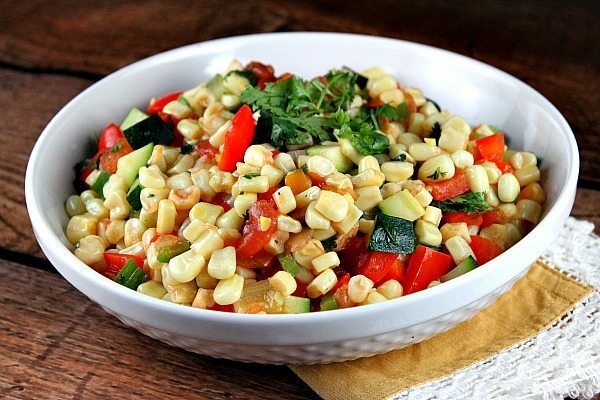 It’s so quick to throw together, and if you’re really lucky… your kids will eat the zucchini and red bell pepper that you snuck into their corn The jalapeno does not make things spicy unless you failed to remove the seeds. Otherwise, it just adds flavor to the dish. And be sure to use mild salsa if you’re serving to kids who like mild-flavored things. I always tell my son if he just digs his spoon in there to take a bite, the whole dish is going to just taste like corn (which he’s madly crazy about). For the most part, I’ve been successful in delving into his psyche and convincing him that this is true. And maybe someday he’ll actually just eat zucchini and bell peppers without needing me to convince him that he’s not going to fall over and die if he eats these things. He’s not super jazzed about vegetables if you’ve clued in to that yet, but I’ll never stop trying! Someday… this kid is going to enjoy them. A lot! In any case, I hope you’ll give this one a shot with your own kids. And I can’t help but want to add a handful of crispy bacon to make it even better. That would hook the kiddos for sure. Next time. Build devices & apps with Bluetooth Smart, an efficient application-friendly wireless technology. The Smart Starter Kit guides you with hands-on labs & source code. Log management and analytics — built for the cloud. Real-time event tracking, alerting and dashboards for system and app performance monitoring. Get started today! Here’s another one of my Stuff I’ve Gotta Share and You’ve Gotta See posts- lots to share with you today! 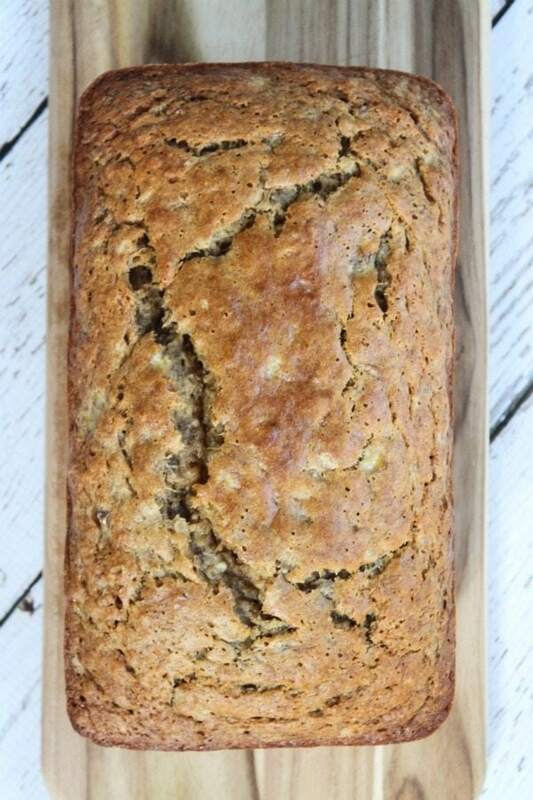 On Parade magazine‘s blog this week, I shared the most amazing Brown Butter Banana Bread from Jessica Merchant’s cookbook, Seriously Delish. 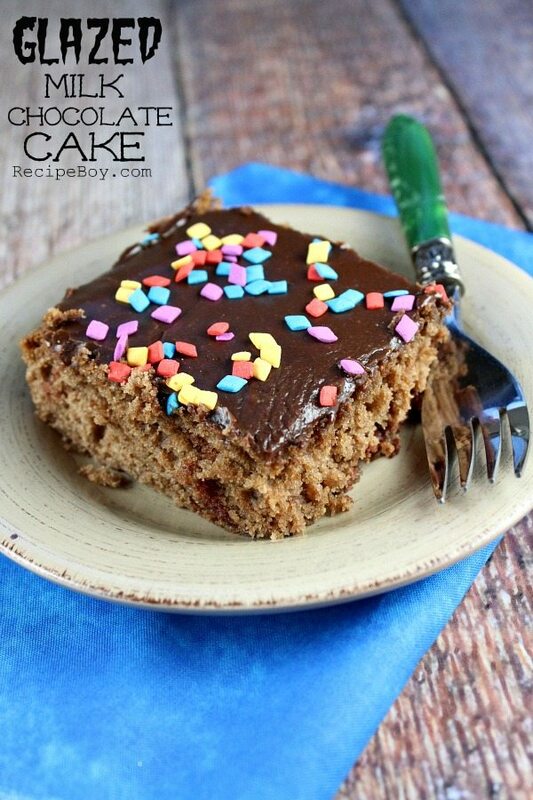 If you love banana bread, you must check out this recipe. It’s really, really good! I’m so proud of my 13-year old son. He had the idea to change up my classic pumpkin bread recipe and add his favorite- Nutella- into the bread. We decided to make it a Nutella cheesecake swirl. It was delicious, and it’s perfect for fall. 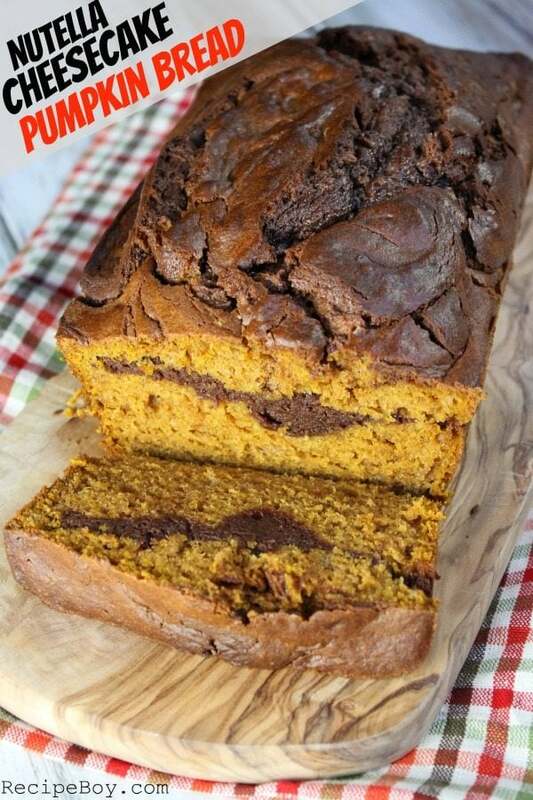 Check out his recipe for Nutella Cheesecake Pumpkin Bread. 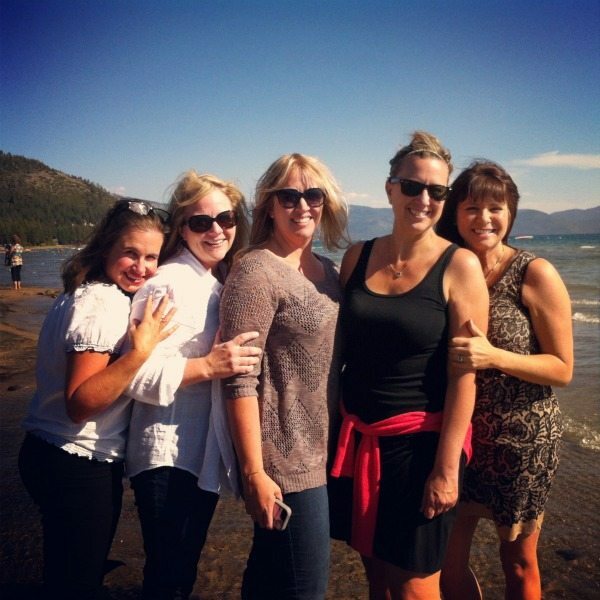 These five beautiful food blogging friends came to visit me recently for a long “blogging retreat” weekend: Pictured are: (from the left) Cathy from Noble Pig, Amy from She Wears Many Hats, Kristen from Dine and Dish, Heidi from FoodieCrush and Sandy from Reluctant Entertainer. They are great friends, and I love their blogs! We all stayed up in Lake Tahoe for the weekend. This was our view from the deck of the house we rented. 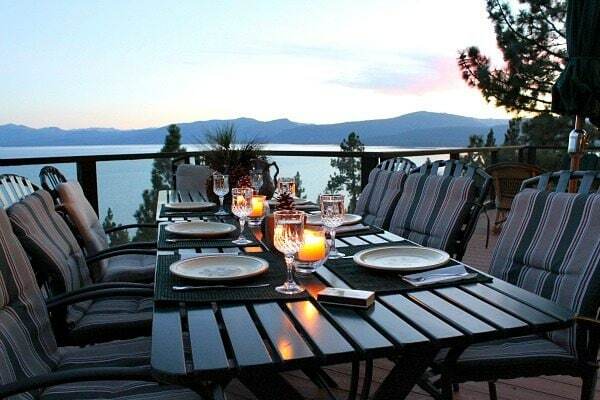 I’ll be sharing more about that house… and Lake Tahoe… soon! We cooked up all of our own dinners on our weekend together. There is nothing more fun than cooking with people who actually like to be in the kitchen! 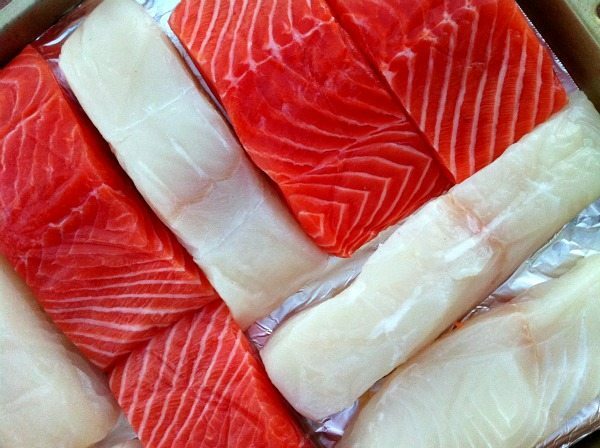 This is beautiful seafood – Northern Halibut and Scottish Salmon that Anderson Seafoods sent to us. They have a fabulous overnight delivery system so you can have it arrive on your doorstep all encased in dry ice and ready for you! We served the salmon piccata-style with a lemon caper sauce, and we served the halibut topped with a yogurt-dill sauce. No recipes- just kind of threw it all together. DELICIOUS. I’ve been searching for a good Yellow Cake recipe for some time now. I’ve finally found a keeper! I’m one of those crazy people who is in love with every flavor of cake EXCEPT chocolate. Give me vanilla or white any day, I’ll seriously jump up and down for spice cake, lemon is luscious and red velvet is a major favorite. I feel the same way about yellow cake. It’s just simply flavored and buttery. Chocolate = not so exciting to me. I’m sort of okay with chocolate frosting though. 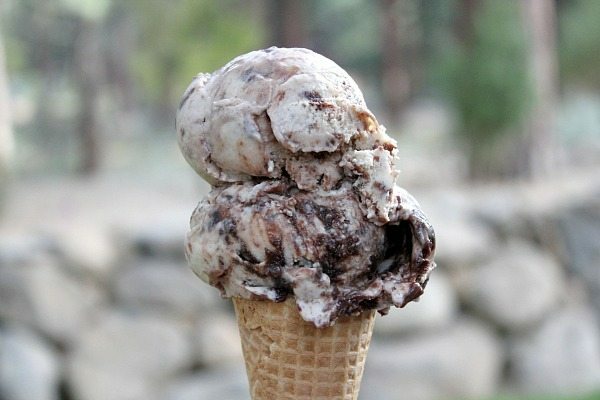 It’s kind of like topping vanilla ice cream with hot fudge… it just works brilliantly well. 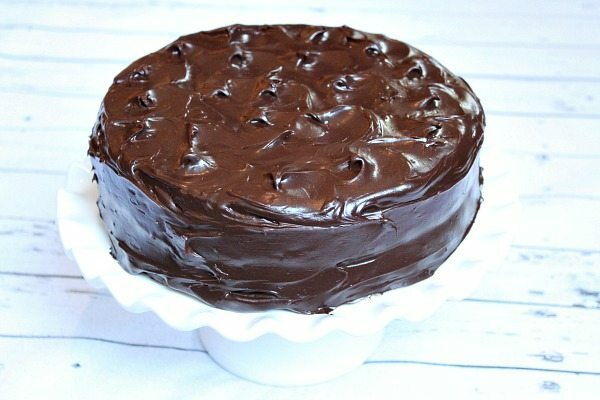 This smooth, velvety, rich and fabulous chocolate frosting recipe I shared yesterday works nicely with yellow cake. So get on that and print it out if you haven’t already. You’ll want to have it on hand for future baking of cakes and cupcakes because it’s that awesome. The yellow cake here is pretty major too. 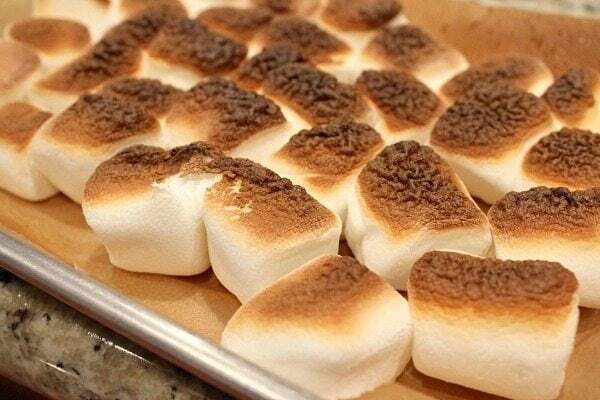 The texture is fluffy and perfect. And the flavor is spot-on. The two layers rise up nicely to the top of the pan, and they’ll rise up even and flat too if you use CAKE STRIPS, which I recommend to every single person I know. They WORK, and you will want to use them on every cake you bake. And there is my keeper-recipe Yellow Cake. I must say that it turned out exactly as I was hoping. It was quite delicious, and I would love to be able to share a slice with you! Since that’s not really possible, go forth and make this cake for the people in your life! You’ll make those people really happy… because everyone needs a little cake now and then. Hurry, before the summer zucchini is gone forever! 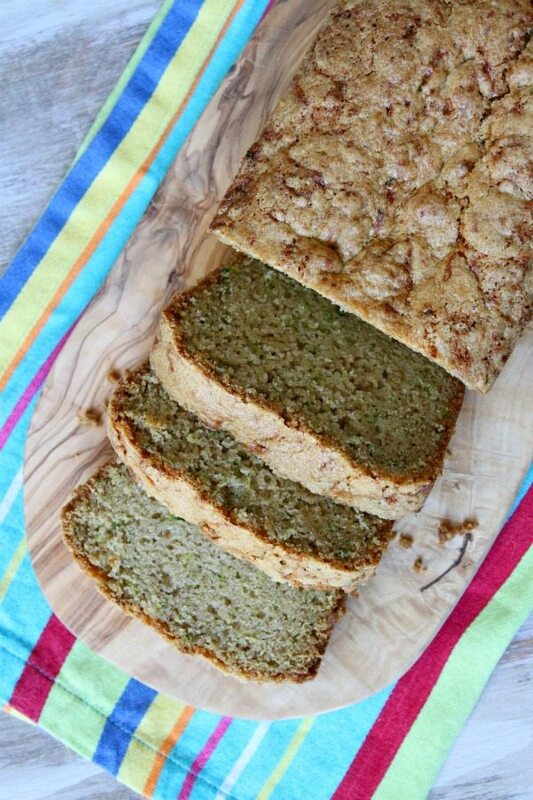 (Or at least until it’s gone until next summer) >> Make some Classic Zucchini Bread. True story: When I was little, my Mom made zucchini bread and zucchini cake ALL THE TIME. And I hated it… with a passion. There was something about it… like it wasn’t sweet enough or it didn’t have great flavor- or perhaps she just didn’t have good recipes (sorry Mom). Everyone else seemed to like it though, so maybe it was just me. Maybe I was frightened by the prospect of including a green vegetable in a CAKE, and I just couldn’t get past it. I guess I’m over it, because I actually LIKE zucchini cake and zucchini bread now! The zucchini just adds a nice, moist element to the bread I made for you today. The flavor of zucchini itself is not present (thank goodness!) Because truly, I don’t normally want vegetables in my cake. 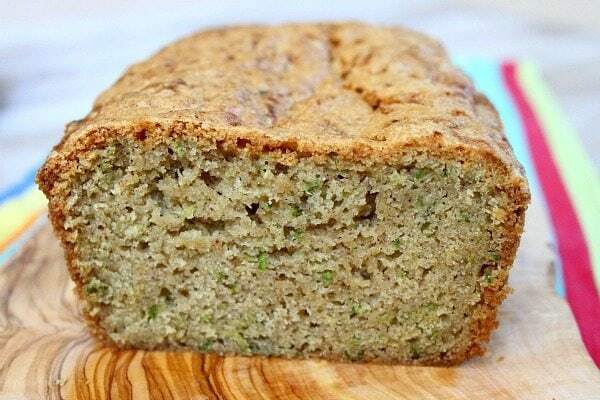 I’m happy to be on board with zucchini bread now. My Mom is gluten-free, so I made a special loaf for her using Cup 4 Cup gluten-free flour (subbed in this recipe for the all-purpose flour). It turned out perfect, and she loved it. By the way, that brand of flour- the Cup 4 Cup is my go-to flour blend when I’m adapting something to be gluten-free. I’ve had great results with it being the one that makes baked goods taste most like normal. I’m happy to admit that I loved this bread too I made a regular version for the rest of my family, and that one turned out perfect as well. Next up: I’m going to be on the hunt for a mega-delicious zucchini CAKE recipe to share with you! 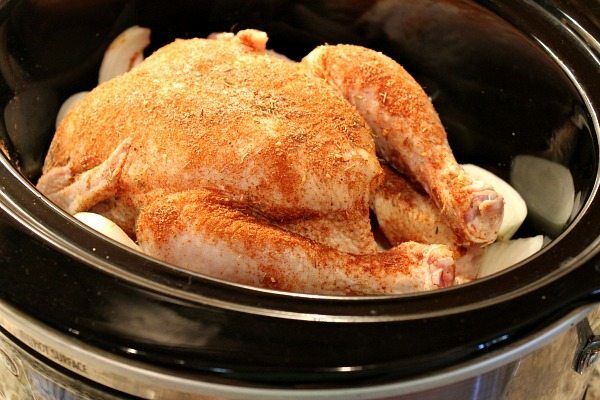 Whole chickens are easy enough to roast and everything, but I don’t know why I’ve never thought to just put a whole chicken in the slow cooker. That’s even better! The chicken cooks completely in about 7 hours on low (which is how I prefer to make it), and the meat pulls off super tender and moist and perfect. The skin is even slightly crispy after all is said and done! 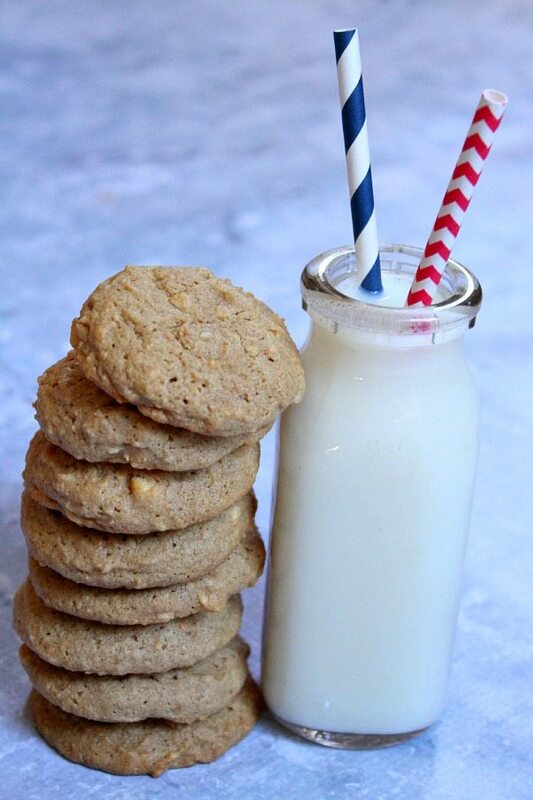 This recipe comes from the fabulous new cookbook by blogger Lisa Leake from 100 Days of Real Food. 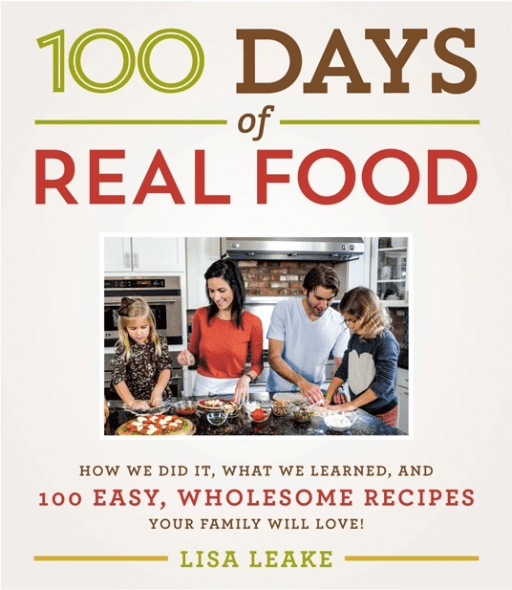 The book is aptly titled, 100 Days of Real Food: How We Did It, What We Learned and 100 Easy, Wholesome Recipes Your Family Will Love. I am loving this cookbook! Actually, I’m loving the whole concept of asking your family to join you on a venture of eating 100 days of real, clean food (no processed stuff). That might be a challenge in my house, but if my family was up to it, I’d be willing to go for it for sure! Author Leake shares her family’s story with you in her book. And the recipes shared are great, family-friendly ideas… things like Whole Wheat Banana Pancakes, Cinnamon- Raisin Quick Bread, Cinnamon- Apple Chips, Cheesy Broccoli- Rice Casserole, Homemade Chicken Nuggets and Carrot Cake with Whipped Cream Cheese Frosting. Is there anything super outrageous in the book? No. These are meant to be recipes that your family will enjoy. I think it’s a great experiment to try on your own family. Go for it! This recipe absolutely could not be any easier. 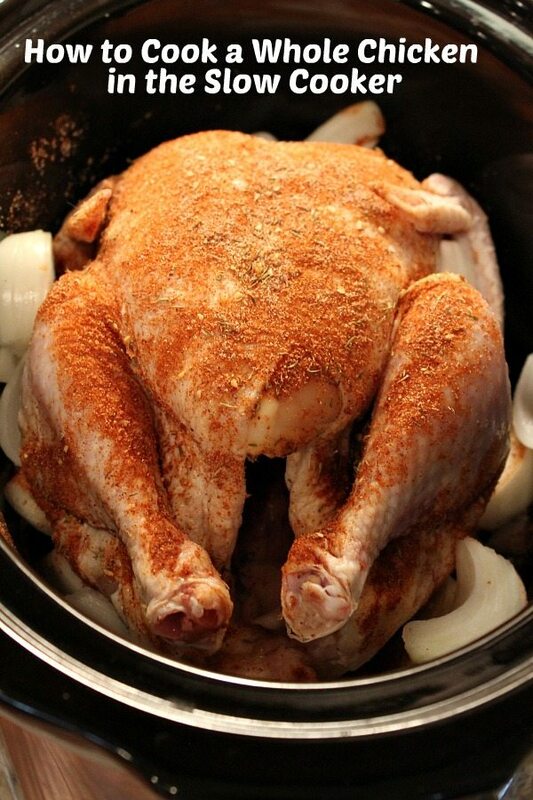 A whole chicken is placed in your slow cooker with some chopped onions, and a mixture of spices rubbed on your chicken and that’s it! Turn it on for 6 hours and dinner is ready later. So easy. I’ve mentioned this story in my cookbook- oh yeah, I have a cookbook! The Recipe Girl Cookbook, which you can still purchase on Amazon if you haven’t gotten around to buying it yet! But I’ll mention it again for you all (and then you can go buy my cookbook!) My very first job was in a cute little place called, The Penguin in Carson City, Nevada. It was one of those burger and frosty kind of places that you see when you’re driving through a small town. I made $2.85/hour and I started working there when I was only 15. It was the best job ever because I got to eat endless amounts of ice cream, burgers and fries galore, and I had frequent visitors from friends. I wonder why?? My very favorite thing to make at The Penguin was a marshmallow malt. Soft serve ice cream + marshmallow syrup + malt powder + milk = THE BEST!!! This ice cream is a tribute to my favorite malt from The Penguin. 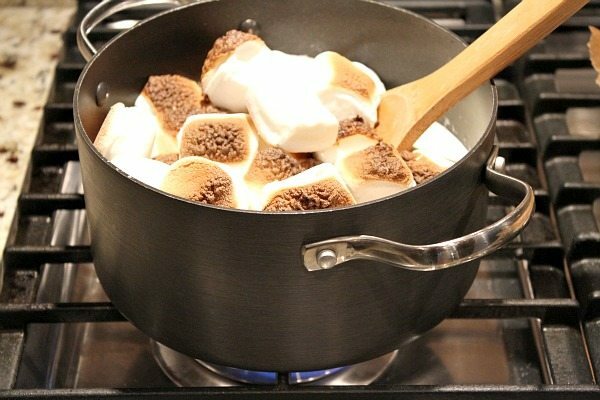 Instead of marshmallow syrup, I used real marshmallows. And I toasted them, of course! YUM. After they were toasted, I melted them into the ice cream base with malt powder mixed in too. After you do that, like any good ice cream base… you need to chill it for quite some time until it is really, really cold. I chilled mine overnight. And then I tried very hard not to drink it with a straw before I poured it into my ice cream maker. That’s how good it is!! Here’s another one of those posts > Stuff I’ve Gotta Share and You’ve Gotta See! 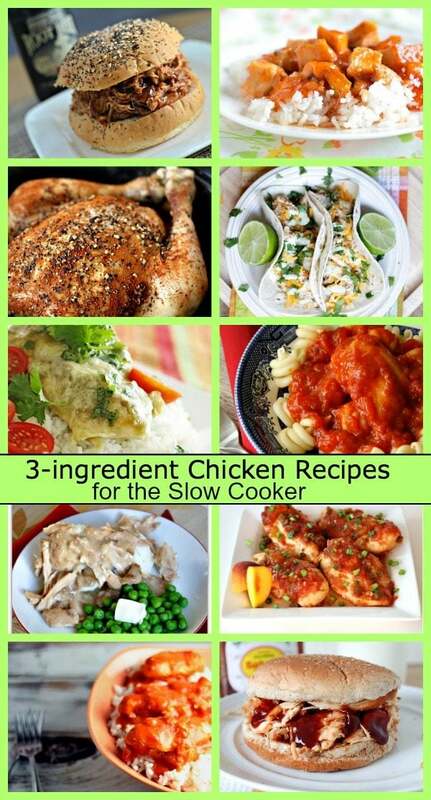 Who is ready for easy dinners made in the slow cooker?? I know I am. The start of school and sports is keeping my family very busy. Recipes like this are lifesavers sometimes!! 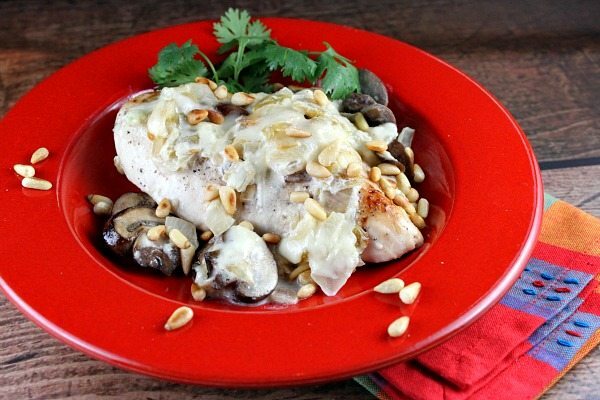 Here are TEN 3-INGREDIENT CHICKEN RECIPES MADE IN THE SLOW COOKER (as shared on Parade Magazine‘s website). 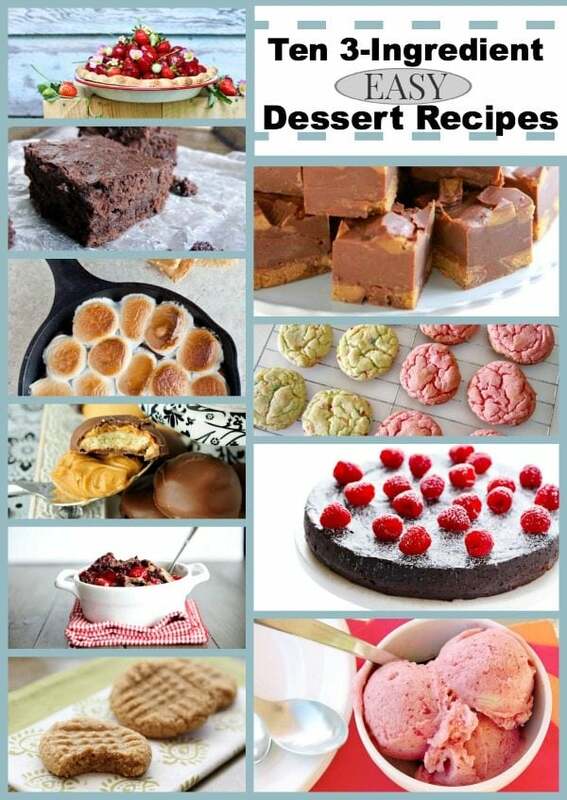 Also shared on Parade was this collection of goodies: TEN 3-INGREDIENT DESSERT RECIPES. Have you ever been assigned to make a dessert for an event and you just don’t have the time or the money to make it?? This post is for you. Easy recipes with just 3-ingredients each. 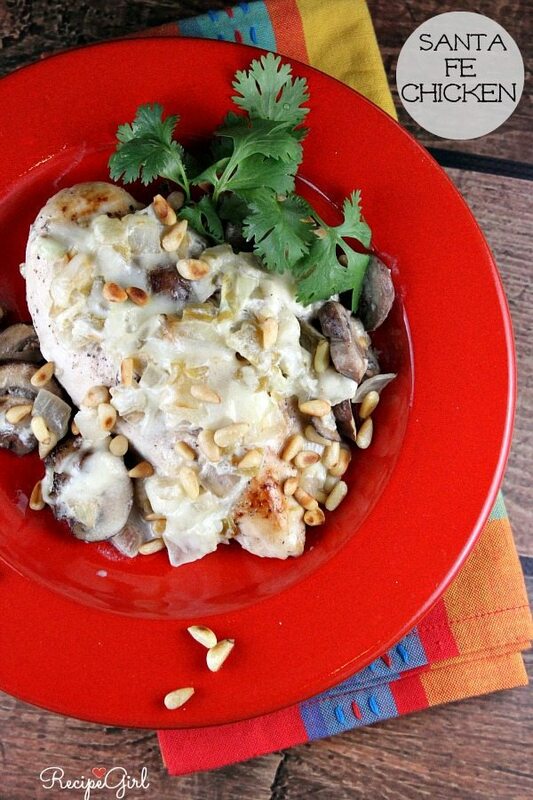 3-ingredients makes it a more economical recipe too! This has been circulating around the internet, and I thought it was pretty interesting. 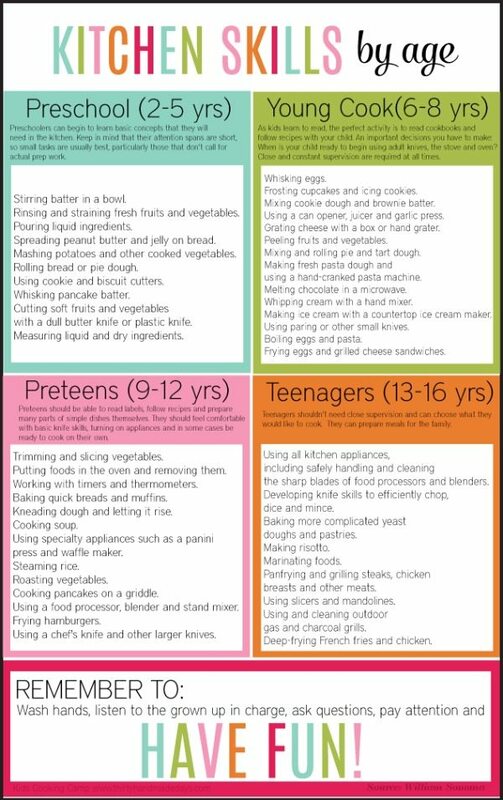 My son is 13, HE HAS A FOOD BLOG, and he is not doing many of the things on this list!! How about your kids? 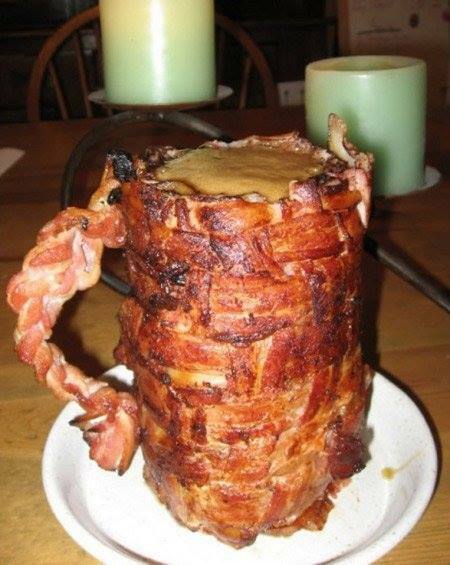 A bacon mug filled with melted cheese, anyone? I sure hope this was just for fun. I’m crazy about bacon and cheese and everything, but… gross. 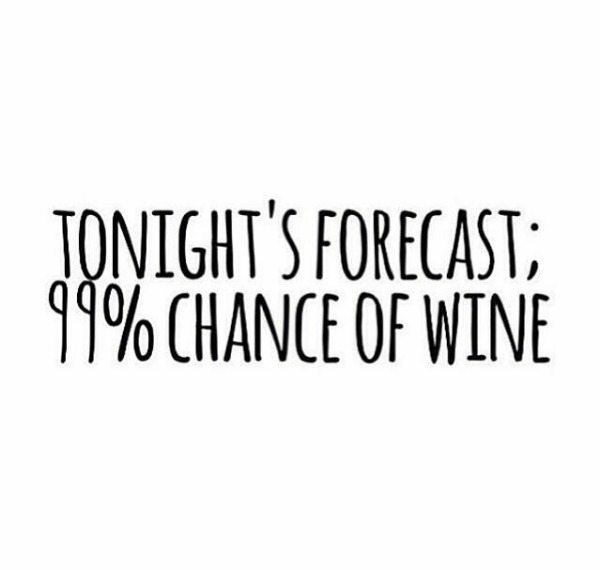 I saw this on my friend Amy’s Facebook page (Very Culinary blog) > And it’s pretty much how I’ve been feeling lately!! Are you ready for some football?? We are definitely ready for football at my house. We root for a few teams around here: Chargers, Patriots, and the 49ers! 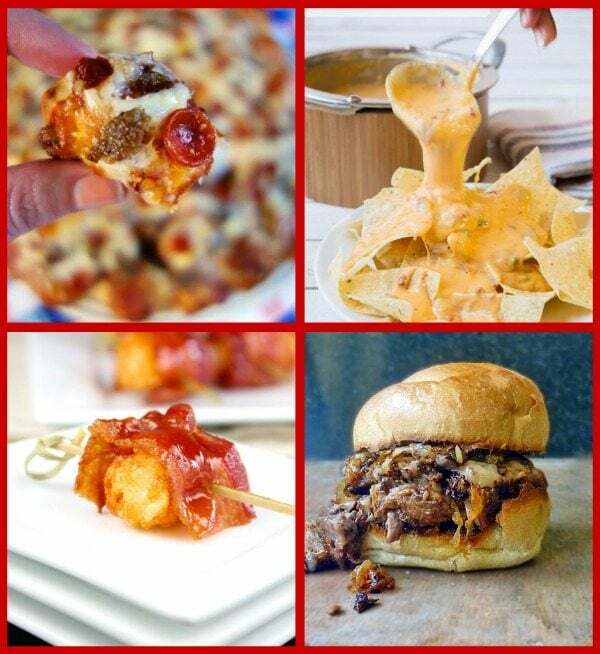 Here is some good football grub that I have spotted for you!